Jonny FELL OVER a small rock and FELL DOWN the mountain. He couldn’t stop himself, and eventually FELL OFF the cliff and INTO the sea. The ambulance rescued him, but the door was open and he FELL OUT of the ambulance and ONTO the road. 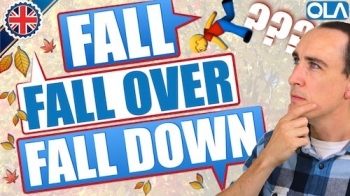 FALL means to ‘come down from a higher position’ or to ‘suddenly go down onto the ground or towards the ground unintentionally or accidentally’. How do we use FALL? FALL is an irregular verb. The past simple of FALL is FELL. The past participle is FALLEN. Mrs. Smith had a terrible FALL (noun) yesterday and is now in hospital. She FELL (verb) in her apartment. The big oak tree FELL in the storm. House prices are FALLING at the moment. We can add many prepositions (down, over, off, up…) after the verb FALL to better describe the direction of the fall. ⭐️ Greg’s Tip: To know which preposition to use after FALL, think of the original position of the object. Where was it before the fall? I FELL DOWN in the supermarket. Built a huge Jenga tower, but my it FELL DOWN when someone opened the window. I wasn’t looking where I was going and I FELL OVER the coffee table. He got on the stage and FELL OVER in front of an audience of 100 people. We use FALL OFF when your original position was “on”. We use FALL OUT when your original position was “in”. FALL OUT as a phrasal verb = have an argument with someone and stop being friends. As ridiculous as it sounds, you can even FALL UP something if your fall happens in an upwards direction. This happens rarely, and usually involves stairs. He was running too quickly, slipped and FELL UP the stairs. We use FALL OUT when your original position was not “in”. She lost her balance and FELL INTO the swimming pool. She was looking at her mobile phone while walking, and FELL INTO a big hole in the middle of the pavement.